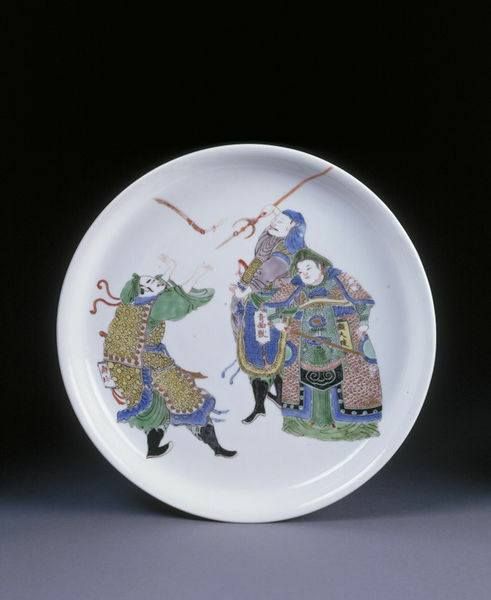 This dish is one of four similarly decorated dishes, all of them painted with figures from the popular Chinese novel 'Water Margin', a story about brave and good-doing bandits comparable to Robin Hood. A distinct feature of the decoration is the absence of any complementary pattern in the background, as if the figures appear on a blank stage without a back-drop. A mark on the base, reading 'Studio to examine one's mind' indicates that the dishes were specially commissioned by a man of letters. On the white porcelain without background or border are painted two men and a woman in overglaze famille verte enamels. The names of the figures are written in a cartouche, making it clear that they are heroes from the novel Shuihu Zhuan (Water Margin). Qingmian shou (green-faced beast) is the nickname of Yang Zhi, the man in the middle, because he has a green mark on his face. On the left is Xie Zhen, a hunter, who was rescued from imprisonment by his cousin Gu Dasao, the woman on the right, described as ' plump, with thick eyebrows and large eyes'. The garments are painted in great detail, and the use of gilding on the armours and weapons to represent metal is particularly effective. On the base, written in underglaze blue is the mark Wenxin Zhai (Studio to examine one's mind) within a double circle. Wenxin Zhai was the studio name of Sun Chong (1617-1702), alias Chongzhi, a native of Gui'an, Zhejiang. If the dish was indeed commissioned by him its date of manufacture would have been no later than 1702, a time when the overglaze blue enamel had just been introduced as a replacement for underglaze cobalt. There are three other dishes with the same mark in the V&A (C1195-, C1197-, C1198-1910), all decorated with warrior-like figures in famille verte enamels but without the cartouches giving the names. Similar dishes are in other collections but not all of them carry the Wenxin Zhai mark. On the back is a piece of paper inscribed "Wm Beckford Esq Bath quinze chaque very fine and rare old enamel". On the base, written in underglaze blue is the mark Wenxin Zhai (Studio to examine one's mind) within a double circle.